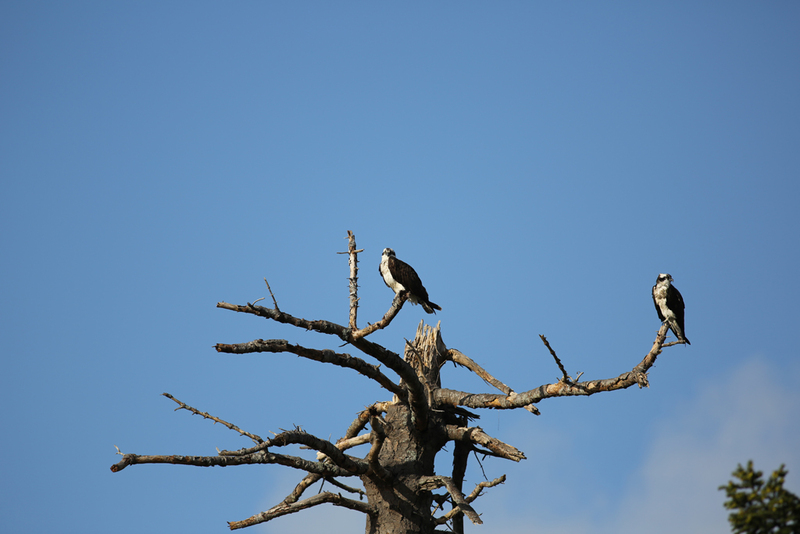 This is my sixth post about ospreys. Okay, I’m more than a little obsessed with them, but not so much that I’m wondering what they taste like. 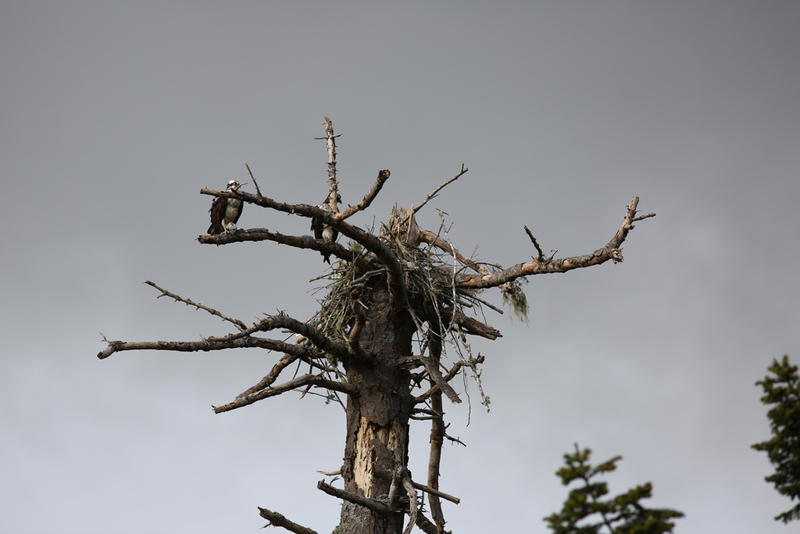 This post will be about their nests. 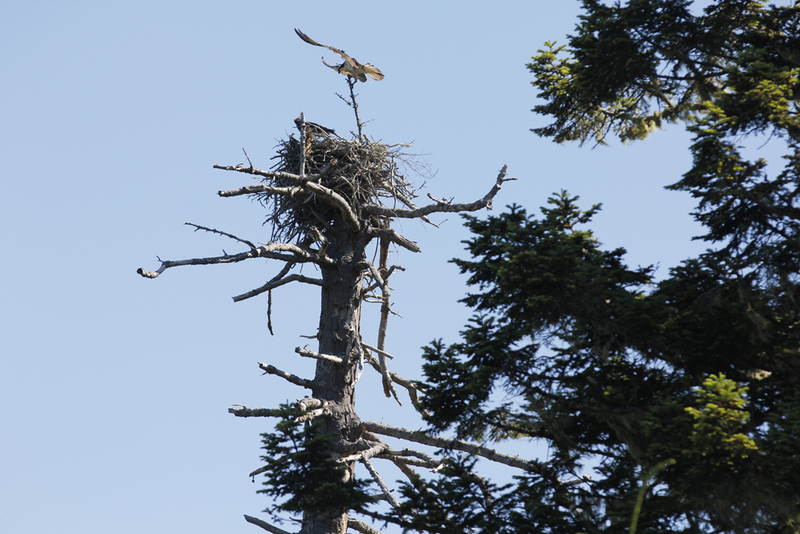 As you would expect, they build their nests near water where they can find fish because fish make up about 99 percent of their diet. They also build them on relatively flat surfaces where they can stack sticks whether it’s the top of a dead tree, a rocky outcropping, or even a manmade platform put in place for them. 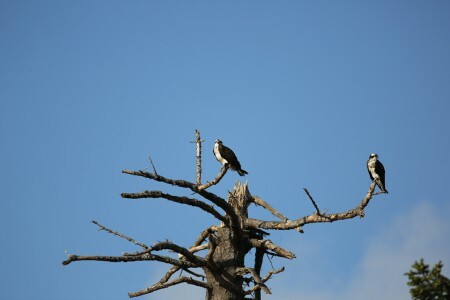 The males build and maintain the nests and the mating pair will return to the same nest, year after year, adding to or maintaining it as needed. 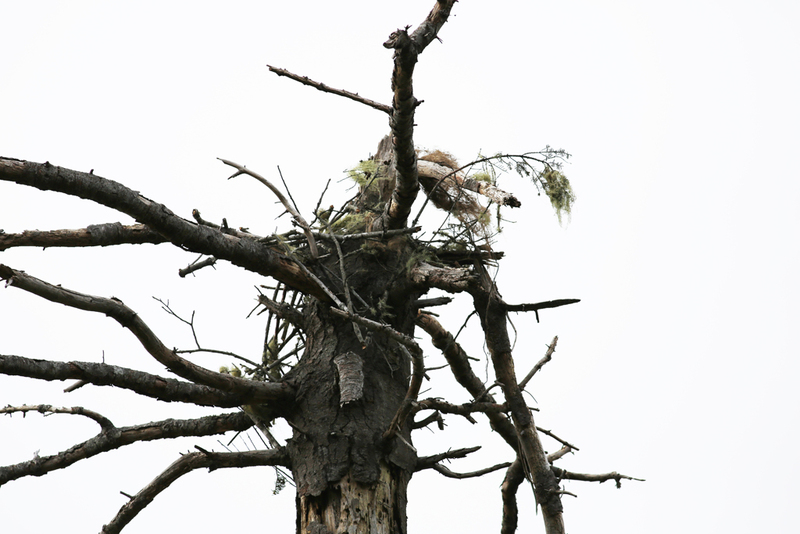 Their nests can often run into hundreds of pounds which they build one stick at a time. Sometimes people (illegally) destroy their nests, other times nature does. The nests here in Oregon usually survive the six months of winter weather while the mating pairs migrate south for the winter. 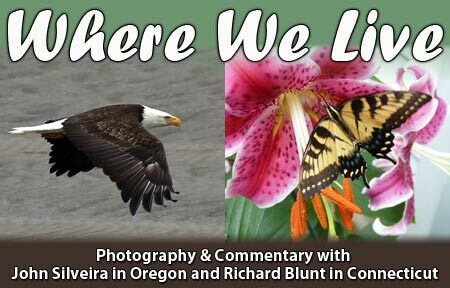 However, this past January, winter storms were fierce enough to bring some of them down. Undaunted, when ospreys return, they rebuild their nests on the same sites or close to them. 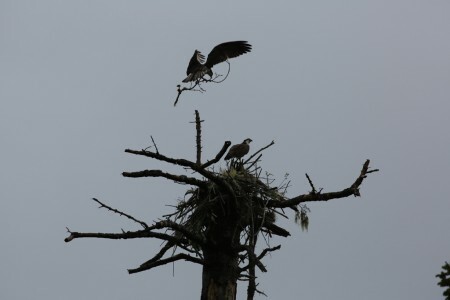 Some of the nests that came down here in Curry County were nests I’d photographed last year, so I got the chance to witness the progress of their reconstruction. 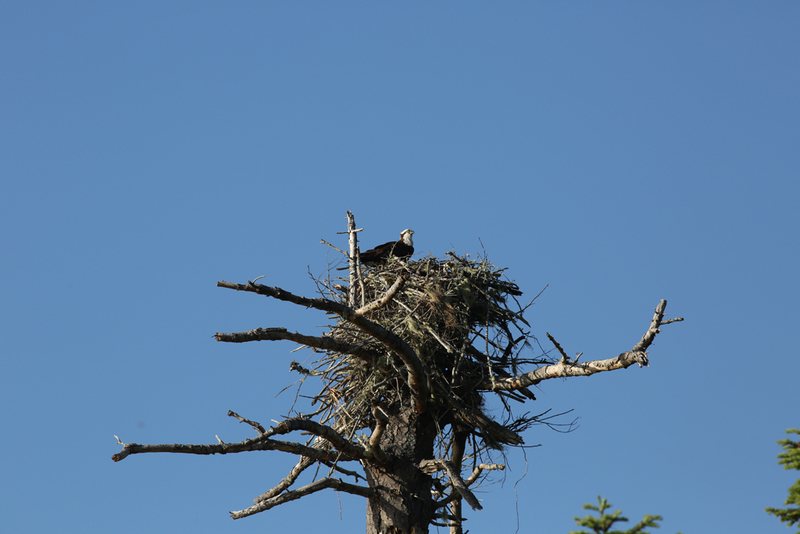 This was a nest on the south bank of the Rogue River, between the river and Jerry’s Flat Road. I’d photographed it many times during the summer of 2011, using my Canon 60D camera and EF 70-200mm f/2.8 L IS II USM lens. I was lucky enough to catch this shot of one of the pair (probably the male), exactly a year ago today, when he was returning with yet another branch to add to the nest. This was one of the nests that came down during the storms of last winter. This next photo and the remaining ones were taken with my Canon 5D Mark III camera and EF 400mm f/5.6 L USM lens. By the 19th of April, it must have been looking pretty much like home to them. 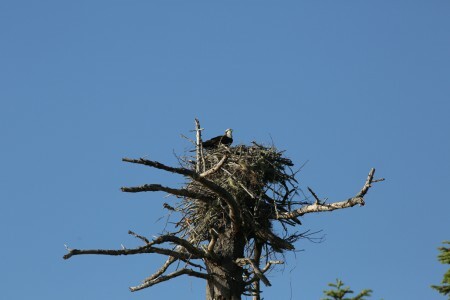 This is the nest as of today, 2 July 2012. 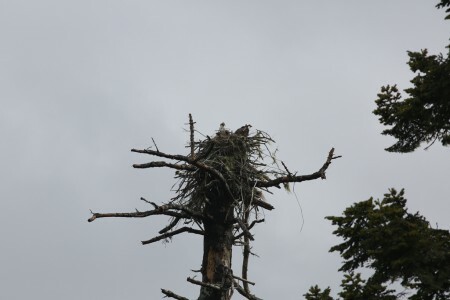 The male will still maintain it and, as long as a storm doesn’t knock it down, it’ll probably get bigger. 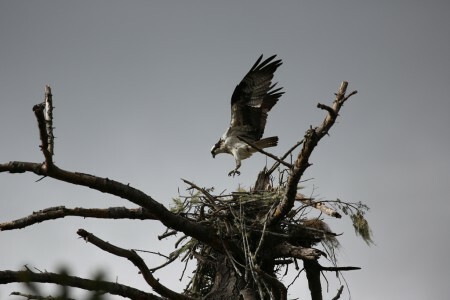 This entry was posted on Monday, July 2nd, 2012 at 7:05 pm	and is filed under Osprey nests, Ospreys. You can follow any responses to this entry through the RSS 2.0 feed. Both comments and pings are currently closed.